FRANCE – Narbonne - Le célèbre Clos de la Lombarde en atteste : le quartier résidentiel de l'antique Narbo s'étendait à l'Est. 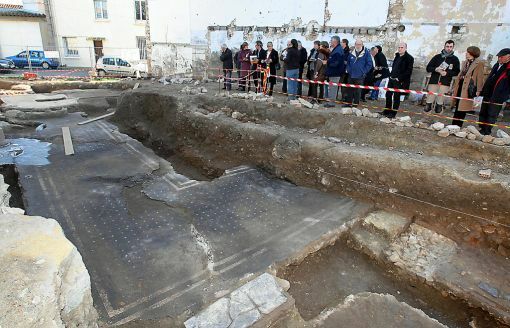 La découverte d'une nouvelle villa romaine, une Domus, entre les rues Edmond-Valentin et Calixte-Camelle apporte une pierre de plus aux vestiges du passé. Et même davantage, puisque des mosaïques, des peintures murales des sols en marbre et des colonnes ont été dévoilées par la fouille d'archéologie préventive. Les investigations sont menées depuis novembre dernier par Hadès, sous la conduite de Zénaïde Lecat, qui a conduit une visite jeudi matin, en présence des élus et des responsables culturels de la ville. La fouille a mis au jour une partie seulement - environ 300 mètres carrés - d'une Domus antique, moins de la moitié de l'ensemble qui comprenait peut-être cour et jardin, détaille-t-elle. C'est la partie où se situe le portique, un grand couloir mosaïqué qui ouvre des accès sur plusieurs pièces. Nous avons identifié une pièce dite 'aux colonnes', en récupérant une colonne entière par morceaux, sa base étant encore en place. 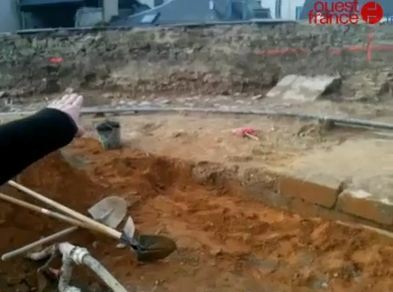 Quelques enduits peints huilés et un plancher qui avait brûlé ont été également trouvés. Ainsi que des fragments de statue en bronze. En bout de fouille, une grande pièce en partie visible décorée avec un opus sectile (des plaques de marbre plus luxueuses que les mosaïques) a été découverte. À l'autre extrémité, deux autres pièces aux seuils conservés présentent elles aussi beaucoup d'intérêt. L'emplacement des murs se devine. Cette maison très riche a dû être détruite par le feu". Vraisemblablement au milieu du IIe siècle, époque où un incendie a ravagé ce secteur de Narbo. FRANCE – Laval - Les archéologues ont commencé lundi leurs travaux de fouilles sur la place de la Trémoille, à Laval. Pendant un an, ils vont collecter les vestiges du passé avant que la place soit complètement réaménagée. Dans notre vidéo, le responsable du chantier, Samuel Chollet, dévoile quelques-unes des premières découvertes. UAE - al-Dur - Department of Archaeology and Heritage in Umm Al Qaiwain has announced new discoveries at al-Dur archaeological site, north eastern of the emirate. Some of the items uncovered at al-Dur include a bronze ring, agate and glass beads, a large jar containing a small glazed-pottery dish,, iron arrow, and dagger blades. Archaeological excavations started in 1970 and continue up to date. The largest pre-Islamic site on the Gulf coast of the UAE, al-Dur is enormous, extending for roughly 4 km northeast to southwest. INDE – Pottha Malai - It was some three months ago, Vijayakumar reached the cave braving black panthers, leopards, Indian gaurs and wild elephants located at Pottha Malai inhabited by the tribes who belong to Mudhuvan community. “The cave is located exactly on the border of Marayur forest range. Mudhuvans speak a language of their own and it’s closely related to Malayalam. Even today, they worship the paintings in this cave,” he said. Vijayakumar, in fact, had tried to get into the cave during day time once. “But, the cave is home to innumerable bats and I didn’t succeed. It was then with the help of local tribes I entered the cave during night,” he revealed. The cave, according to him, measures to a size of 1,186 meters in length and 782 meters in breadth. Mudhuvans call the cave Orunan Alai. Orunan represents Varuna the Lord of Rain and ancient Tamil term for cave is alai. The reference appears in porananooru. Mudhuvans pray before the paintings even today for copious rains. The paintings, originally, were red-ocher, according to Vijayakumar. “But, tribes during later period had super-imposed them with white-ocher. Because, the famed hand appearing twice still remains in red-ocher,” he explained. It’s historical fact that tribes bow before the famed hand symbol, which they consider as the hand-mark of their ancestral chief. “The symbol is God to them. It must be for this reason they abstained from repainting it with white ocher,” he felt. The white ocher, according to him, is made using the milk derived from Arali (sapium insigne) and Kalli (euphorbia antiquorum). Vijayakumar, interestingly, is the first person to crack the secret behind the making of white-ocher. According to him, kumil tree (gmelina aroporea) is first burnt and its pure white ash along with calcium carbonate (CaCo3) is mixed with the milk derived from Arali and Kalli plants. “It’s using this substance the painting are drawn,” he confirmed. The paintings based on nature theme depict sun, couple of elephants, man-atop-a-deer, five monkeys and 28 sketches of the early man. The figures range from 5 centimeters to 32 centimeters in size. Eminent epigraphist S. Ramachandran confirmed, the painting belonged to 1000 BC. “It must have been a period of hunter-gatherers. Paintings that depict wild animals and tribal dance confirm this,” he said. He’s surprised the term alai (cave) survives even today among local tribes. “In the early Vedic period, you won't find the sound ra. That’s why Surya's earliest form was solar. Down ages la could've become ra since arai or ara presently means shelter", he opined. Ramachandran further confirmed, no one till now knows how exactly the white-ocher is made and what goes into its making. "Vijayakumar has done a splendid job by unraveling the secret by taking the tribes into confidence", he said. AUSTRALIE – Hobart - Parry Kostoglou is the man digging up Hobart's past. The historic artefacts found in Hobart are building a clearer picture of the city's past. Mr Kostoglou said because Hobart did not have a lot of high-rise buildings, the archaeology of most areas was still intact underground. "They basically just knocked down the buildings and built up. The ground now is two to three metres higher than it used to be in most places," he said. Because of this, the living spaces of people in the 1800s were often traceable under the concrete slabs of modern buildings. Mr Kostoglou said he hoped some of the unique items found at the Myer site in Liverpool St, where he is currently working, would be displayed in the new building. Arabic coins, Chinese dinnerware and elaborate tobacco pipes from the 17th century are among some of the more unusual finds. FRANCE – Escalles - Il existait donc à Escalles, 4 000 ans avant notre ère, un camp de hauteur délimité par un fossé barrant le sommet. Les archéologues ont dégagé 100 mètres du fossé déterminant les contours de l'enceinte. Le tracé en arc de cercle devait s'appuyer sur le relief naturel du Mont-d'Hubert. Il n'y avait pas de palissade mais certainement un talus. Deux passages du fossé ont été identifiés. Des meules en grès, des bois de cerf, des os d'animaux, des coquillages du silex taillé, des céramiques, des haches et des restes humains ont été découverts. La vocation de cette enceinte n'est pas tranchée. Serait-elle de nature défensive, simple enclos à bestiaux ou encore lieux de culte ? 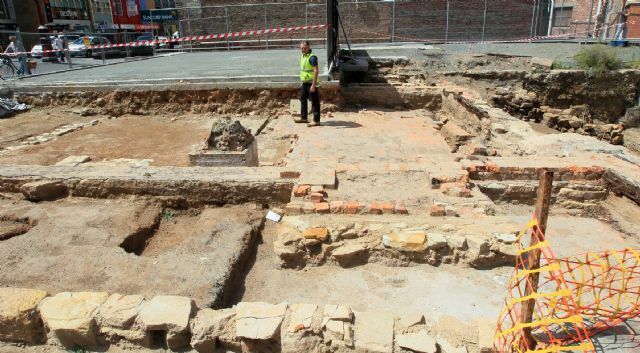 ROYAUME UNI – Manchester - Archaeologists will carry out a three-week excavation at Birley Fields in Hulme before a new university campus is built on the land. One aim of the project is to find remains of a farm that could date back to the late Medieval period – thought to be the first time people lived in the area. A team of archaeologists from Manchester Metropolitan University believe the foundations of hundreds of terrace houses built at the start of the industrial revolution also lie below Birley Fields. Project director and archaeologist Dr Faye Simpson said: “This is a really exciting chance to document Hulme’s forgotten past. From looking at old maps we believe the first occupation of the land was Jackson’s Farm in the late Medieval or post Medieval period, the 16th or 17th Century, which looked like quite a significant building with outhouses. We are also hoping to find the foundations of the terrace houses built for factory workers at the start of the industrial revolution. “There will definitely also be people’s possessions down there and in the past we have found quite personal things like cups and children’s toys.” Little is known about Jackson’s Farm, which appears on a map of Hulme dated 1831. The large building and outhouses are believed to have stood on the site for many years before that. The name Jackson is thought to refer to the family who first lived there. INDE - Karimnagar - Within one month, miscreants targeted yet another ancient monument in Karimnagar district for ‘hidden treasures’. A tunnel was dug up, in search of a treasure trove, at Racharla Fort, which was built in 1400 AD. The incident came to light two days ago. About one month ago, unidentified miscreants damaged 2000-year-old Buddhist stupa at Dulikatta in the hunt for a treasure trove. According to historical records, Singamraju, a Kakatiya king, ruled the province in which Racharla Fort fell. “Gold coins embosed with the images of Sita Ramanjaneya were in circulation under his rule and the miscreants might have been searching for them,” historians suspected.